Amazon has presented a new member of its Kindle family – the Kindle Oasis e-reader – which the company claims is the thinnest and lightest e-reader Amazon has ever released. The device can now be pre-ordered with shipments expected to commence in the coming weeks. The new Kindle Oasis is really a thin and light device – the Wi-Fi only version weighs just 131 grams, while the version with Wi-Fi and 3G weighs 133 grams, which is about 20 per cent less than its predecessor. The device is 3.4 thick in its thinnest point and 8.5 mm thick in its thickest point. In addition the new e-reader comes with a plastic chassis that has been covered with metal in order to become sturdier. 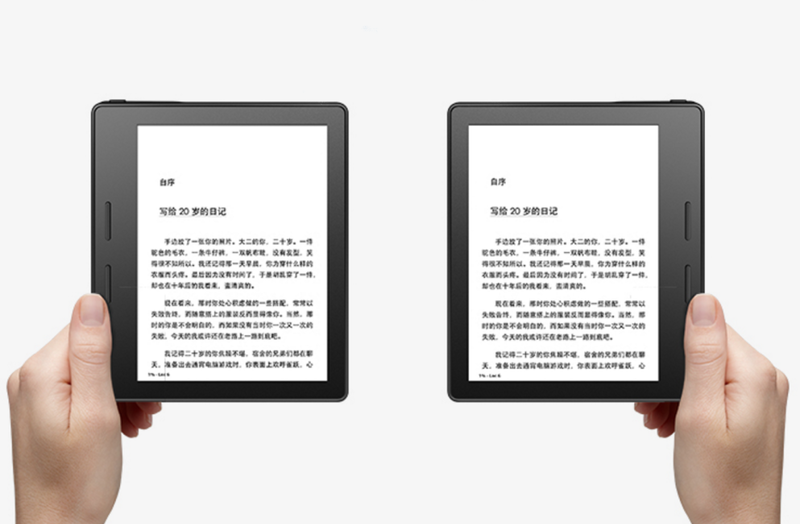 The Kindle Oasis comes with a 6-inch Paperwhite (E Ink Carta) display that features 300 pixels per inch but like before the display is black-and-white only. It can show 16 different shades of gray, though. The battery inside the e-reader promises to power the device for up to 28 hours with no Wi-Fi enabled and it can be charged in three hours by using a PC USB port. Inside the e-reader comes with 4 GB of internal memory but if this is not enough you can use Amazon’s cloud services for free. The new Amazon Kindle Oasis costs USD 290.